Do you shop at Old Navy? Do you have friends who do? Well, you might want to reconsider before you $pend your well-earned money there again. 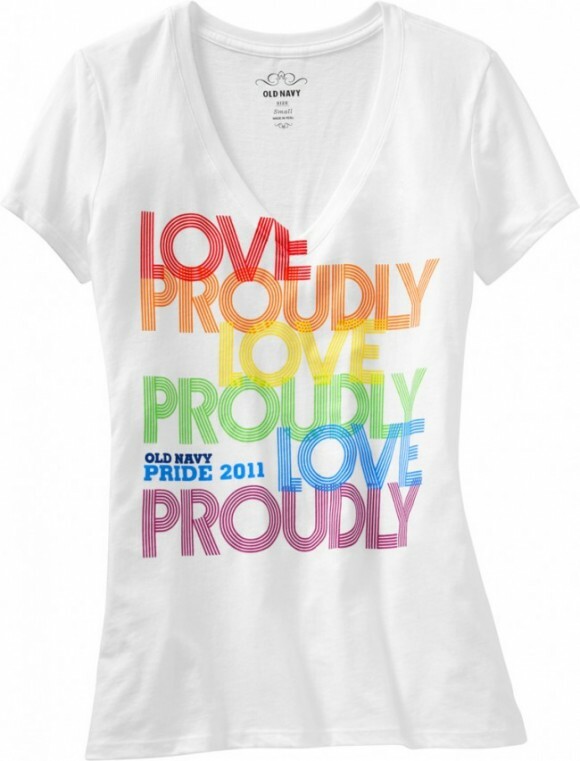 Old Navy has now launched a line of rainbow colored Gay Pride T-Shirts. There are four different designs for men, women, children, and… BABIES! I am OVERJOYED with the sentiment. And thrilled they will be in kid sizes also. Our 6 year old would rock that shirt and never know she was promoting the gay agenda. My children will likely be sporting them to school next year! This is VERY disturbing to me… The rainbow now has a different twist to it. The Biblical idea of the rainbow is not this beautiful reminder of God’s covenant of Noah’s day. Now, the RAINBOW = INDOCTRINATION! As Christians, should we support an agenda like that? I do not think so. Of the 1,035 Old Navy store in the United States, a select few will supply these shirts–26 stores total. SHARE THIS WITH EVERYONE! BOYCOTT OLD NAVY!! During the week of April 25-30, eat at Chick-fil-A and hand them a card of Thanks! A few weeks ago, AFA alerted you to an attack by homosexual activists against the Christian-owned Chick-fil-A company. In February, a Chick-fil-A restaurant in Pennsylvania donated some sandwiches and brownies to a marriage seminar hosted by the Pennsylvania Family Institute. Because the seminar promoted marriage as between one man and one woman, pro-homosexual activists launched an all-out attack on Chick-fil-A. Chick-fil-A plays Christian music in its restaurants…exclusively. Chick-fil-A closes all its locations on Sunday…no exceptions. Chick-fil-A’s stated corporate purpose is: 1) To glorify God by being a faithful steward of all that is entrusted to us; and 2) To have a positive influence on all who come in contact with Chick-fil-A. AFA is encouraging you to “BUYCOTT” a Chick-fil-A restaurant during the week of April 25-30. When you pay for your meal, take a moment to thank them for standing on Christian principles by printing and handing them the Chick-fil-A “Thank You!” card (Print an entire sheet of cards for family and friends here). Watch this short video by AFA President Tim Wildmon, then print your “BUYCOTT Chick-fil-A” thank you card! It is very important that you forward this alert to your friends and family members. If you don’t have a Chick-fil-A in your area and would still like to thank them, you send an email note through our online email campaign. Posted: April 14, 2011 in Movies, Politics, What Happened? Do you need a better idea of what’s the movie about? Watch the video below from Freedom Works. It’s all about the parallels. Millions of Tea Party supporters have rallied over the past two years, many have brought with them signs referencing Atlas Shrugged. As you rally on April 15th for your local Tax Day protest, I urge you to go see this important film. The film is set in a not-so-distant future in which government has taken control of the means of production, bureaucrats have impose harmful regulations on businesses and turmoil in the Middle East has sent oil prices skyrocketing. Sound familiar? Rand’s iconic novel provides striking parallels to today’s political rhetoric. Posted: April 14, 2011 in Movies, What Happened? If you have done some or a lot of research about the new movie coming out tomorrow: Atlas Shrugged, you probably, like me learned that this is NOT a Hollywood production. Hollywood has choosen not to buy the rights to turn Ayn Rand’s popular novel into a film. Why?